UNITED NATIONS, December 8 -- After the representatives of Sudan and South Sudan traded divergent stories in prepared speeches inside the UN Security Council on Thursday, both emerged separately, eying the stakeout area and its UN Television camera. At first, neither would speak on camera; one of them speaking to Inner City Press insisted that he not be recorded. The questions in dispute ranged from whether the contested town of Jau is in Sudan or South Sudan, whether a separate human rights team should be let into the Abyei area, and whether Sudan's nominee to head the administration there is in fact a resident of Abyei. Even among Security Council members, positions on where Jau is changed throughout the morning. US Ambassador Susan Rice on her way into the meeting told Inner City Press of Jau, "it look like it is in Sudan." To her credit, she stopped on her way out of the meetings and told Inner City Press "I'd like to revise and extend my earlier remarks," saying "the bottom line is nobody knows" if Jau is in South Sudan or Sudan. Another Council representative told Inner City Press, referring to UN Peacekeeping boss Herve Ladsous, "he's still going a survey, the guy doesn't even know where it is." Despite a request to the Office of the Spokesman for Secretary General Ban Ki-moon that Ladsous do a stakeout and take questions, including about Jau and DPKO's failure to go to the site after days of deadly fighting, Ladsous once again did not do a stakeout. 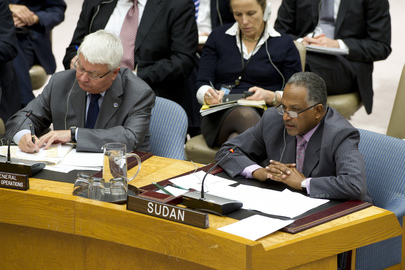 Last time on Sudan -- when Ladsous refused to answer a question about the UN being challenged for DPKO allegedly bringing cholera to Haiti and then refusing to set up a standing claims commission as provided for in the Status of Forces Agreement -- Ladsous answered Inner City Press that a SOFA for Abyei would be in place very soon. But the troop contribution country on Thursday told Inner City Press there is still in place no status of forces agreement, the lack that contributed to the deadly delay in medical evacuation of four peacekeepers. Ladsous should now answer: where is the SOFA he promised? Why has it not been finalized and signed? There were other important issues that Ladsous should have addressed and had answers to but didn't. South Sudan's David Choat said that Sudan is refusing to let in human rights observers; Sudan's Permanent Representative Daffa-Alla Elhag Ali Osman said such observers should only come in as part of the civilian component of the UNISFA mission. While Choat for some reason never did a stakeout, Sudan's Daffa-Alla Elhag Ali Osman emerged after all Council members had left and strode to the UN TV camera. The cameraman had left, but was summoned back. Inner City Press asked Daffa-Alla Elhag Ali Osman why not allow humanitarian access to Jau. He said, "for our part, we would be happy to allow access to all those area, once we assure the safety and security of the personnel there." Video here, from Minute 5:50. So when will the UN go there? On the question of the human rights observers, Daffa-Alla Elhag Ali Osman responded instead about how Sudan allows transit of South Sudan oil without charging a fee. He insisted that Sudan's candidate for the Abyei administration is a resident of the area. Inner City Press asked, how that the Sudanese Defense Minister has been indicted by the International Criminal Court, how will he deal with the UN and its Peacekeeping missions, given the issues that arose when the UN Mission in Sudan twice used UN helicopters to fly ICC indictee Ahmed Haroun. Video here, from Minute 9:31. Daffa-Alla Elhag Ali Osman said that the "ICC is not part of the UN system... it has to prove itself." Which seems to be the UN's or at least Ladsous' DPKO's, position too: asked twice by Inner City Press, the response was that nothing will change with how the UN deal with Sudan's defense minister since his indictment. Before he left the stakeout, Inner City Press asked Daffa-Alla Elhag Ali Osman for Sudan's position on the sanctions adopted earlier in the week against Eritrea. Video here, from Minute 11:14. Inner City Press: There is this sharpening dispute between Sudan and South Sudan about oil, one of the unresolved issues left over from the CPA. And now China has sent an envoy that is now viewed as the sort of main broker, and I wondered, some have questioned, what is the UN’s role? Is this issue of the economic relations between the two States, is this still part of Mr. Menkerios’s mandate and is he involved in these discussions? Spokesperson: I have to check on precisely what Mr. Menkerios is doing in this context. In response to your question yesterday, DPKO advises: The Office of the Special Envoy for Sudan and South Sudan is supporting any mediation effort that can improve relations and provide solutions to reduce tensions between Sudan and South Sudan. Special Envoy Menkerios is in contact with the Chinese Special Envoy Liu Giujin to that effect and continues working in close consultation with the African Union High Level Implementation Panel.